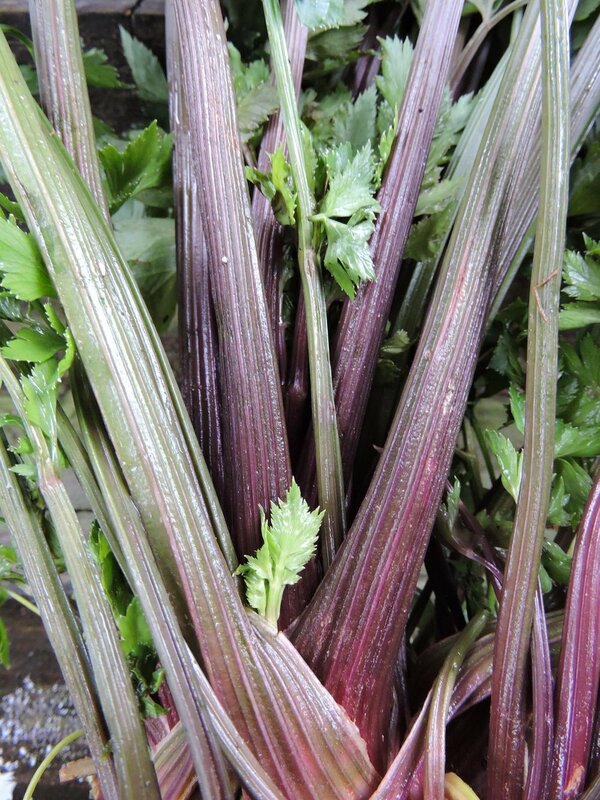 In 1894, the Peter Henderson & Co. seed house of New York introduced Pink Plume celery. Its beautiful appearance and intense flavor inspired gardeners and seed companies to add it to their collections. By 1903, over 100 seed houses across North America were offering this variety. In 1981, Seed Savers Exchange compiled the first census of commercial variety offerings in the United States since the 1903 USDA census. By that time, ‘Pink Plume’ was no longer available. It re-appeared in the late 1990s, and it has been offered somewhat episodically since then. As of 2015, ‘Pink Plume’ had once again dropped from the seed trade. We are pleased to re-introduce it. This is a very strongly flavored celery. Gardeners know that the celery grown at home has a much richer and complex flavor than the celery found in most stores. Diced celery is a part of the "culinary trinity" of stock/broth, known as mirepoix, which also includes carrots and onions. Mix 2 parts onions to 1 part each of carrot and celery to form the flavor base for many stocks, soups, stews, and sauces. Cajun and Creole cuisine also includes celery in "the trinity" along with onions and bell peppers. The trinity is the base of dishes such as gumbo and jambalaya. This crop can be direct seeded into the soil after the last spring frost. You can also start plants indoors 6-8 weeks before the last frost date. Space your plants or seeds 6-8 inches apart in well fertilized soil. Plant your seeds 1/4-3/4 inch deep. Make sure that your soil is well fertilized as this crop is a heavy feeder and takes a lot of nutrients from the soil. Consider adding compost to the soil the year before you plant. Mulching the soil around this crop can help protect the plant and keep roots cool and moist.